"The essence of modern combined arms operations is movement. Tactical situations change rapidly. Directions of attack are shifted. Reserves are brought forward and committed to get an attack rolling again. It takes a set of rules specifically designed to work at the operational (battalion/regiment) level to capture the operational flavor of mobile warfare. Command Decision is designed with exactly that in mind. Realism and accuracy are important to a historical miniatures game, but the designer's job is to isolate the most important aspects of realism. If a game is technically accurate but is very slow-playing, it fails to simulate the most important aspect of mobile warfare — speed. 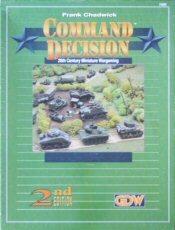 Command Decision is designed to be, and is, played in real time. The tactical situation develops on the gaming table at the same tempo as on the battlefield, and you have to make your decisions under the same time constraints as your historical counterpart. No more spending forty-five minutes on a turn which represents one minute of real time! Command Decision contains everything you need to get started in World War II miniatures gaming except the miniatures. It is designed to be played either with 1:285 micro-scale miniatures, 15mm scale, or 20mm (HO, 1:76, 1:72) scale miniatures. 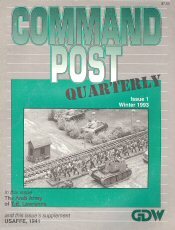 The basic rules present a comprehensive but fast-playing system for mobile combined arms ground combat in the decade of the forties. Advanced rules layer on additional considerations such as weather, paradrops, tank repair, resupply, and air power. The national data charts present complete game information on every important weapon system used by the U.S.. Great Britain, Germany, the Soviet Union, and Italy during the war. The organization booklet provides a year-by-year look at the infantry, armored and motorized organizations of those belligerents and presents the information in terms of game organizations. As a reference source alone. Command Decision is invaluable. Most miniatures players enjoy fighting out campaigns, but few playable campaign systems have ever been published. Command Decision includes a complete historical campaign, the Battle of the Stolberg Corridor, fought in September of 1944 on the western front. The campaign booklet includes complete orders of battle for both sides, which include both the historic unit identifications and arrival dates as well as their strength and organization in game terms. The forces employed are very manageable. A campaign map shows the terrain over which the battle was fought. Six separate scenarios from the campaign are included, each of which makes an interesting table-top battle, and campaign rules allow players to refight the entirety of this closely-matched contest." 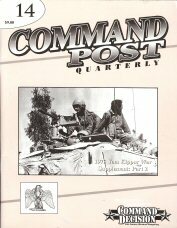 - A 96-page rules booklet, covering all important aspects of modern combat from 1939 to 1992, including armor, infantry, aircraft (both fixed and rotary wing), airmobile, and amphibious rules. In addition, a six-scenario sample campaign (Stolberg Corridor) in included, along with rules for running your own campaigns. - Armies of World War II, Volume I, a 224 page book containing divisional tables of organization and equipment for the major powers of World War II: France, Germany, Italy, Japan, Poland, the United Kingdom, the United States, and the USSR. - A National Data Charts booklet, containing game statistics and data on every major weapon used by the eight nations covered in Armies of World War II, Volume I. - Two counter sheets, containing marker chits for Command Decision's innovative command system, morale markers, and status chits. In the 1930s, many of the world's military thinkers were divided into two schools of thought: infantrymen who felt that infantry was still supreme and should be supported by small units of tanks, and tank men who thought that large formations of tanks would dominate the battlefield. Neither was right. In 1939, the Germans unleashed a new offensive not based exclusively on infantry or tanks, but their integration into a balanced combined arms team. The principle of combined arms has dominated doctrinal thinking ever since. 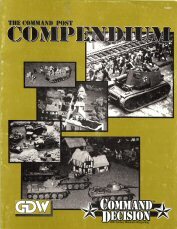 Command Decision is a set of miniatures rules which enables players to refight operational-level combined arms engagements from 1939 to 1992. It shows the importance of each element in a fast-playing format that uniquely captures the pace and tempo of modern mobile combat. Speed of decision is emphasized, and the player who can make the right decisions fastest will achieve victory. Designed for use with, HO, 1:200, or 1:300 scale figures and vehicles. Command Decision uses a platoon scale (infantry stands represent platoons of 40-50 soldiers, vehicle models represent platoons of 4-5 vehicles)." "On December 16, 1944, the German Army unleashed a massive offensive in the Ardennes forest of Belgium. Known as The Battle of the Bulge, this epic struggle is remembered as one of the U.S. Army's greatest victories. Essential to the final U.S. victory was the stubborn defense of the critical road junction at Bastogne. Defended by the 101st Airborne Division, the town was besieged by a Volksgrenadier division and two of Germany's best divisions: 2nd Panzer and Panzer Lehr. Called upon to surrender, the commander of the 101st, Brigadier General Anthony McAuliffe, answered with the single word, "Nuts!" Reinforced by Combat Command B of the 10th Armored Division and other units, the Americans fought back German attacks from every direction. The Germans for their part were torn between the need to take Bastogne and the need to get mobile troops to the Meuse immediately. GDW now presents the defense of Bastogne as a campaign module for Command Decision, its World War II miniatures rules. This module contains everything needed to fight the campaign with strategic map moves and then resolve the resulting encounters as miniatures games. All you provide are the miniatures. Bastogne makes a particularly good campaign. Since this was an encirclement battle, no rules are needed for units on either flank of the battlefield: there are effectively none. The campaign lasts from the start of the German offensive until the relief of the town by Patton's 3rd Army from the south. Thus, the game covers periods of both intense positional warfare and rapid armored breakthroughs. Both sides have a wide variety of troop types and troop quality, and most equipment types in use in 1944 are represented, from M-18 tank destroyers to massive German Jagdpanthers. A number of new organizations for Command Decision are included as well, notably, some German non-divisional armored units such as the Jagdpanther battalion and assault gun brigade. For the U.S. there are corps artillery and engineer battalions. U.S. divisional artillery battalion organizations have been changed to reflect the greater manpower in the units and to give them the capability for self-defense that they demonstrated numerous times during the battle. New equipment ratings include the U.S. 4.5" towed gun and artillery tractor and the German 75mm and 88mm Feld Kanone (AT guns mounted in field gun carriages)." "Modern combat is fast, furious, and deadly. Both NATO and the Warsaw Pact emphasize the value of moibility and firepower, and this doctrine is expressed in a vast and technologically sophisticated array of weapons. Laser range-finders, thermal sights, radar-seeking missiles, and counterbattery radar all add to the accelerated pace which is the trademark of modern combat. 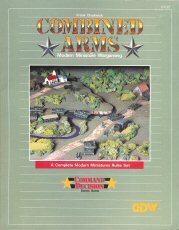 Combined Arms has been designed to portray the machines, the speed, and the confusion of the modern battlefield within a playable miniatures rules system. 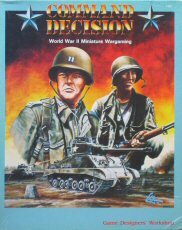 Based on the popular Command Decision rules for World War II miniatures wargaming, Combined Arms balances realism and accuracy with playability to produce a game tha not only plays quickly, but also is fun to play. Combined Arms is designed for play at the operational level of combat and is played in real time. 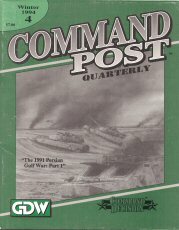 A premium is placed on command, and the game is designed to reflect the need for command control over a battlefield which is rapidly changing. Decisions need to be made quickly and accurately, or you can lose control of the battle." 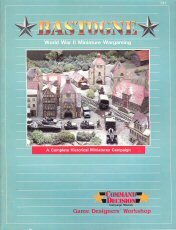 "Barbarossa/25 recreates in miniature the greatest of all land campaigns ever fought. Every aspect of the campaign is reduced by a factor of 25 in order to bring the vast scale of the campaign in the Soviet Union down to manageable proportions. The available forces, ground scale, and time are all divided by 25. The sweep, mobility, and grandeur of the Russian Front are converted into a playable miniatures campaign without losing the excitement and flavor of the original conflict. 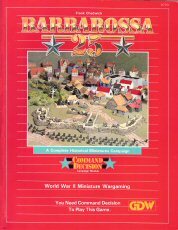 Using the award-winning Command Decision World War II miniatures rules, Barbarossa/25 presents everything needed to fight out the initial battles of the World War II between Germany and the Soviet Union. Extra rules provide the structure players need to play at the strategic level: Strategic movement uses a set of campaign maps, and battles are resolved as miniatures games. Barbarossa/25 contains detailed unit lists, plus tables of organization and equipment (TO&Es) for all participant nations, including Germany, the Soviet Union. Hungary, Finland, Slovakia, Rumania, and Italy. New organizational data is included for such diverse units as independent German mountain infantry regiments, Rumanian infantry and cavalry regiments, security battalions, Hungarian mobile battalions, Soviet militia rifle battalions, and cavalry regiments. Equipment ratings are given for the fighting ordnance of the Axis Allied Armies. Status sheets, help players track changes in composition, troop quality, and morale for basic units of manuevcr (and are handy references to the status of forces). A detailed order of battle lists the starting setup, reinforcements, and troop -quality and morale for both air and ground units. 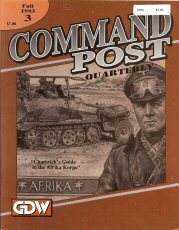 Barbarossa/25 requires Command Decision (or a similar set of World War II) to be played. This book includes strategic campaign rules, orders of battle and appearance, unit organizations, and strategic planning maps." "The end of the Victorian era was the end of an age of innocence. Industry, technology, and science developed hundreds of new weapons, but they had never seen full-scale use. By 1914, the weapons were in place, but the generals did not yet understand their importance. Stuck with preconceived notions of a quick war decided by maneuver, the strategists were forced down a long road dominated by machineguns, trenches, artillery, mortars, and poison gas. Their quick war turned into a long, dismal battle—the first world war. 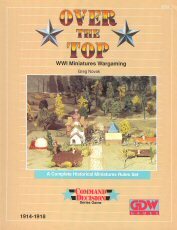 Over the Top is a definitive set of miniatures wargame rules. They allow players to recreate the problems that bewildered commanders three-quarters of a century ago. All the weapons of the period are represented: gas attacks, artillery barrages, trench systems, rudimentary armored fighting vehicles, and the machinegun. 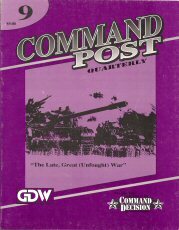 Based on the proven and award-winning Command Decision wargame rules system, Over the Top casts players in the roles of general officers ordering battalions, regiments, and brigades into battle. Over the Top includes 10 WWI scenarios designed to produce a maximum of military action. Scenarios vary from the simple, one-afternoon engagement to more involved and complex situations. • Home Before the Leaves Fall. A bathtub World War I game of the 1914 campaign (covering both fronts). • Last Stand at Tsingtau. The Japanese and British assault on the German enclave in China. • The Western Desert. The British Empire against the Libyan Moslem Senussi. • Massacre of the Innocents. The BEF against German reserve units at Ypres. • First Blood. The BEF against advancing Imperial German forces at Mons. • Steaming Down to Tanga. British forces invading the German East African colonies. • "C'mon, You Leathernecks." U.S. Marines against the Kaiser's troops at Belleau Wood. • Forty Thousand Horsemen. Australian cavalry against German/Turkish troops in the Holy Land. • Armistice Day. Trotsky's Red Army against a ragtag collection of British, Canadian, and American forces. • Return to Khyber Pass. British forces against the Afghans. Complete organizational and technical information for Austria-Hungary, Belgium, Britain (including the Commonwealth), Bulgaria, France, Germany, Italy, Montenegro, Rumania, Russia, Serbia, Turkey, and the United States..."
"Armies of the Second World War, volume I, is the first in a three-part series covering every major unit of World War if for use with GDW's Command Decision miniatures rules. 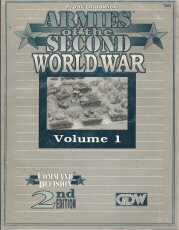 Volume one contains divisional tables of organization and equipment for the major powers of World War II: France (10 organizations), Germany (31 organizations), Italy (17 organizations), Japan (nine organizations), Poland (three organizations), the United Kingdom (12 organizations), the United States (13 organizations), and the USSR (24 organizations). 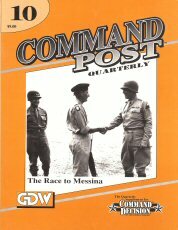 Every important division organization from 1939-1945 is presented in an easy-to-use format; the French Division Legere Mechanique, German panzer, panzergrenadier, and Falschirmjager Divisions, Italian Bersaglierei and Alpini Divisions, Japanese Infantry and Armored Divisions, the Polish Infantry Division, British and Commonwealth Infantry and Armoured Divisions, American Infantry, Armored, Airborne, Marine, and Mountain Divisions, and Soviet Rifle, Cavalry, Motorized, and Tank Divisions. The Armies of the Second World War series contains every organization you will need to refight the major campaigns of World War II, in the European, African, and Pacific theaters." • Villers Bretonneux, April 24,1918"
CONTENTS: Armies of the New World Order, Part 1 - The USMC; Semper Fi Mac! 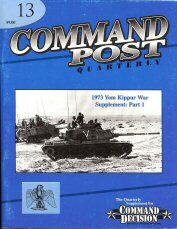 ; Heavy Metal Revisited; Chadwick's Guide to the Afrika Korps; A Quiet Spot - Bloody Ridge; Kuwait International Airfield; Walt's Cavalry Regiment; A Report from Goose Green; more. 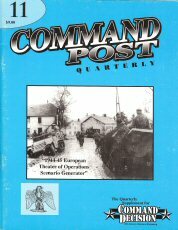 • "Rangers, Lead the Way"
"Before there was the Command Post Quarterly, there was the Command Post. Because of the success of that original newsletter, we went on a regular schedule with CPQ, and it's set new standards for presentation of miniatures supplemental material for over two years. But what about the good stuff in the original Command Post? Many current CPQ readers never got a chance to see it, but we didn't want to reprint it in CPQ, because that would penalize the readers who have been with us the longest. 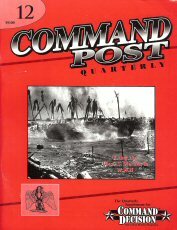 Our answer: The Command Post Compendium — a compilation of the best and most useful articles from the original Command Post. • And it's got lots of Other Good Stuff, too. This is the very best of the material from the original Command Post."